3506 - Driven Transmission Fluid - Max Duty Super F - Brakeswap.com - Friction for the Win! Formulated and tested to perform in extreme pressure and heat, the PAO full synthetic base oil delivers outstanding high temperature stability. 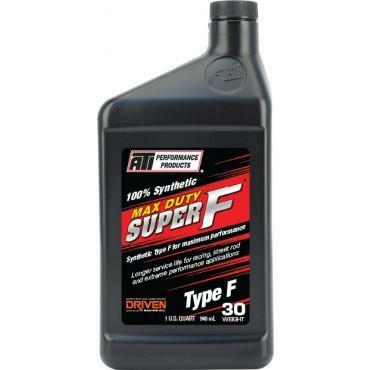 Like the Super F ATF, it contains anti-rust and foam inhibiting properties, as well as Type F friction modifiers that allow for firmer shifting. It also increases high temperature protection and shear stability while offering an improved low temperature flow and seal protection which allow for longer fluid life. Recommended for the following transmissions: GM Powerglide, TH350 & TH400; Ford C4 & C6; Chrysler TF727 & TF904.